You can probably count on both hands how many times you’ve woken up almost crippled after a night on a less than stellar sofa bed. There’s nothing quite like the bruise left over from the slats and springs poking into your back all night. A poorly constructed sofa bed is a terrible thing and one that is more common than we’d like to admit. Also known as a sofa bed or daybed, the sleeper sofa is a clever addition to square-footage starved rooms. Got a guest room the size of a postage stamp? Sleeper sofas for small spaces function both as a seating area and a bed without taking up the massive area that a traditional bed and couch combo would. A Mythical Beast – Is There a Comfortable Sleeper Sofa? Unlike the sasquatch or loch ness, a comfortable sleeper sofa can seem like a myth. Like the above critters, it’s tricky to find if you don’t know where to look. The perfect sleeper sofa needs to combine both comfort for sitting and sleeping as well as durability. The key to finally capturing this wily beast lies within the mattress itself. High-quality sleeper sofas should be equipped with a mattress at least 3 to 5 inches deep. 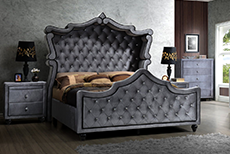 Anything lower than that and you’ll be able to feel the slats of the frame as well as any springs that might be present in the mattress construction. Some modern daybeds or sleeper sofas eliminate the threat of spring bruises with the use of high-density latex foam mattresses rather than coils. These pillow top delights conform with your body and support all the pressure points for a good night’s sleep. Whether you’ve got the space for a queen size sofa bed or you’re creating your own cozy corner sleeper sofa additions are the way to go. At 1StopBedrooms, we have gathered the best and most affordable sleeper sofa collection online. We are strident when it comes to quality and have purchased all our products from reputable big lots sleeper sofa companies willing to help up cut out the middleman. The result? A fantastic deal on the kind of sofa bed that will make your guest room or living room the hottest new Air B&B in town!